First, we should put things into perspective by stating that alfalfa is still the best choice, in most cases, for long term production of high quality, high tonnage harvested forage. We also expect to see increased use of corn silage, where topography and farm plans permit in dairy rations, in the alfalfa-based rations. While grasses can produce high quality forage well in grazing systems, they tend to be high in fiber when allowed to grow to higher yields for harvest as hay or haylage. The high fiber will restrict animal intake in dairy rations. Other legumes, while providing good forage quality, tend to be lower yielding than alfalfa. 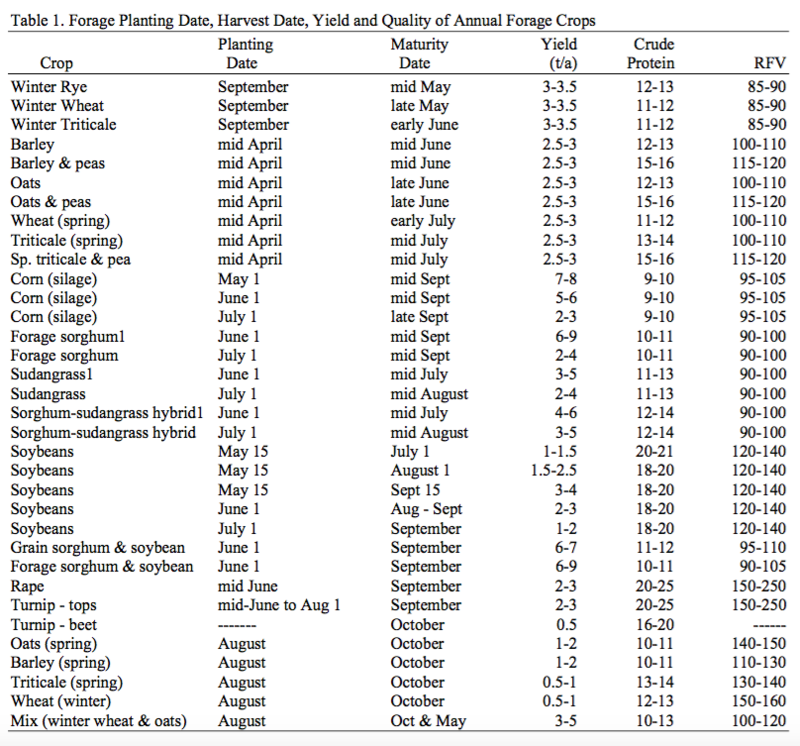 The alternatives available for harvested forage tend to be annual crops (table 1). The first portion of the table, covering small grains, is listed in order according to when the crops would normally be harvested for forage. Yield and quality values are intended to represent average occurrences to allow comparisons among forages. It should be recognized that yields on individual farms may be more or less than shown depending on management and weather conditions. All yields are expressed as dry matter tons/acre. When intending use is for silage divide dry matter yields by 0.35 to convert to tons silage at 65% moisture. Yields are estimated for southern Wisconsin under high management and should be adjusted accordingly for other regions. Crude Protein is expressed on a dry matter basis. For crops where more than one harvest is likely, only the date of the first harvest is listed. Small grains should be harvested at boot stage (head beginning to emerge from leaf whirl) for milking dairy cattle and at early heading for other categories of animals. The same is true for small grains seeded with peas. Small grains are definitely cool season crops and have greatly reduced yields when planted later in the spring or over summer. Fall plantings, except for oats) tend to produce little forage in the seeding year. We would not recommend late summer seeding alfalfa with small grains as the cover crop will slow down development of alfalfa and increase risk of winterkill. Seeding a mixture of spring oats and winter wheat in the fall will allow for forage harvest in October (primarily oats) and again in the spring (winter wheat). Small grain-field pea mixtures have gained popularity as an emergency crop. Primary benefit of peas mixed with small grains is to improve quality and palatability; yield effects are variable ranging from 0 to 0.5 t/a increases. Peas may be mixed with oats, triticale, or barley. The top yielding varieties of each species perform better than the poorer-yielding varieties of all other small grain species. Small grain-pea mixtures have wider harvest window. Increased forage quality has been observed with higher pea seeding rates up to 100 lb/A. However, diminishing returns and cost of peas suggest that the optimum seeding rate is 20 to 30 lb peas per acre. Corn should be harvested for silage at beginning at 65% moisture (which may be close to half milk line). Forage sorghum should be harvested for silage at milk stage. Forage sorghum, sudangrasses, and sorghum/sudangrass hybrids are better adapted than most species to drought, high temperature, water logging, and low soil pH than corn, but will yield less in seasons with cool August and September. Sudangrass and sorghum/sudangrass hybrids should be harvested at 3 feet of height (two to three cuttings for season). Harvesting at later maturity may increase yield but will result in very low forage quality. Soybeans should be harvested at R7 stage (when first pods are beginning to turn color). The idea is to harvest just before beans have begun to form. Soybeans do not ensile well because of high oil content and should be mixed with a grass (e.g. corn, sorghum, sudangrass) at chopping to improve ensiling characteristics.